This modern country style accommodation unit is situated in the heart of the agricultural estate on Moshav Sde Yitzhak and is suitable for couples and families. The unit is surrounded by large flower beds that blossom all year round. In a beautifully quiet and pastoral area of the Sharon Plain in central Israel is this Zimmer and cabin lodging site. In each Zimmer you will find a large double bed, pleasant seating area, satellite television and DVD, a kitchenette with utensils and hot and cold drinks with light snacks. In most of the Zimmers there is a luxury Jacuzzi. In the heart of the green village near the city of Rehovot you will find this country style Spa with Zimmer accommodation which is a place for elite treatments in a tranquil and pastoral atmosphere. Located on Dizengoff Square, 800 m from the beach, White House offers accommodation in the centre of Tel Aviv. Free Wi-Fi access is available. The Dizengoff Centre Shopping Mall is 200 m away. All rooms are air conditioned and come with cable TV and a private bathroom with a hairdryer and free toiletries. Located in the heart of Tel Aviv, the Bell Hotel offers free parking and Wi-Fi, free access to the spa, and views of the sea and of the Tayelet seaside promenade. It`s a 2-minute walk from the beach and 15 minutes from Jaffa Old City. 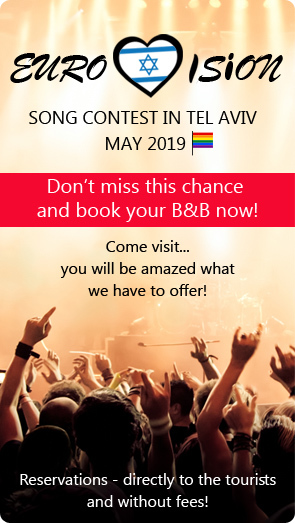 Celebrate with us in style at Tel Aviv`s newest mini hotel, where guests are treated to our unique brand of family hospitality. Budget accommodation in Tel Aviv has never been better. The hotel is located on Herbert Samuel Street, on the boulevard that kisses the coastline, and in walking distance from all the food and hot spots of the city of Tel Aviv. Crowne Plaza Tel Aviv City Center is one of Tel Aviv`s most modern hotels. Set next to Azrieli shopping center, it has unique rooms with views of the city. Guests have free access to a fitness center with Olympic pool, sauna, and spa facilities. Rooms at this Crowne Plaza have free Wi-Fi, an LCD TV, and a tea/coffee maker. The majority of rooms have a personal computer and media center with webcam. Some rooms include access to the Executive Lounge. Isrotel Tower Tel Aviv Luxurious rooms and suites at the best location in Tel Aviv.This property is 2 minutes walk from the beach. With panoramic views over Tel Aviv and the Mediterranean Sea, the Isrotel Tower Hotel offers a rooftop pool and free WiFi. It has air-conditioned rooms and suites, complete with a satellite flat-screen TV. TLV88 SEA HOTEL Indulge Yourself in our Boutique Hotel Tel Aviv Experience the white city from its most distinguished spot, The TLV88 Sea Hotel in the heart of the - Tel Aviv sea front - With elegant luxuries and modern comforts, we are your ideal choice for work and leisure visits. Welcome to the Hotel Beit Maimon. One hour’s drive from the central part of Israel, you will find a magical, charming spot, with a relaxed rustic atmosphere and breathtaking, scenic views. Beit Maimon is a small family hotel situated in a European village setting, located on the western slopes of Zichron Yaakov. Offering an outdoor pool and an indoor pool, Elma Arts Complex Luxury Hotel is located in Zikhron Ya‘aqov. Free WiFi access is available. Each room here will provide you with a flat-screen TV and air conditioning. There is also a coffee machine. The private bathroom also comes with a bath or a shower. Extras include satellite and cable channels. Old Colony Zichron Yaacov we built for you, seeking peace from the hustle everyday big city 5r `luxurious and well-equipped accommodation. My place in the courtyard `` `` Colony magical lawn with seating areas, barbecue and night lighting. The view is breathtaking, blending scenery of fish pools and green fields beneath. While you soak in a bath of wine, relaxing to the sounds of wind blowing through the trees, your body unwinds to the intoxicating scent of fresh picked grapes. Then, after a gentle exfoliating grape massage, you relax with your loved one in a private room, watching the last rays of the sun flickering in the horizon while your taste buds savor a rich platter of assorted cheeses and wine. `Welcome aboard the Mañana, a luxurious and indulging sailing yacht, whose crew will sail you to a special and unique perspective of Israel with local Galilee cuisine and excellent local wines & beers. In the heart of the vineyards and olive groves you are welcome to stay at the “Meshek 81 Cabin”. Here you will find a pretty hidden corner with our lovely wooden cabin which is fully furnished to the highest standard and surrounded by a beautiful green garden. A charming wood-built appartment-chalet with a mountain view, situated in the peaceful and calm region of Israel known as Israels`s Tuscany. Set right on the beach in Ashkelon, Leonardo Hotel Ashkelon features an on-site restaurant, an outdoor pool and offers free access to its spa and wellness centre. With a unique design, each room has free WiFi and faces the Mediterranean Sea. This property is 2 minutes walk from the beach. Showcasing an outdoor pool and seasonal outdoor pool, Harlington Hotel is located in Ashkelon, just 48.3 km from Tel Aviv. Guests can enjoy the on-site restaurant. Private parking is available on site. In the heart of the Sharon are these country style Zimmers waiting for you in a different kind of atmosphere. The suites are luxurious and beautiful and include a television, DVD, mini bar, king size bed, luxury Jacuzzi and many more luxuries. Offering panoramic views across Carmel Forest and the Mediterranean Sea, this hotel is part of the Beit Oren Kibbutz. Its air-conditioned rooms feature a fridge and tea and coffee-making facilities. Luxury accommodation for couples only. If you are a couple seeking excitement in the air Mediterranean, a clean and stylish, intimate, cozy seating areas and a quiet course .... this is for you! Wake up in the morning sea breeze and the sound of the waves to experience the sunset over the cliff. Conveniently located between Tel Aviv and Haifa just few hundred metres from the coast, lies this beautiful estate offering luxurious ambiance in the heart of Caesarea`s 18-hole golf resort. Free Wi-Fi is available throughout the property. The Dan Caesarea offers a wide range of indoor and outdoor facilities including a swimming pool and children’s pool, tennis courts (day/night), table tennis, volleyball, football and mini- football pitches, basketball courts, water basketball, mini golf and cycling. “Gan Eden Bakarmel” is situated on the Shokef hills surrounded by the trees of the forest. The guest house overlooks the Shokef Wadi and Kibbutz Beit Oren with a spectacular mountain view. In this mountain atmosphere and between the trees of the forest are these new 10 guest units, all luxurious and furnished to the highest standard. The rooms are equipped with the best country furniture and are stylishly designed with a Middle Eastern style seating area, dining room, cable television, air conditioning, Jacuzzi and more. Come and stay at these 6 accommodation units which offer full luxury and are fully equipped in the village of Daliyat Al-Karmel. The accommodation site is situated in a very quiet area and is equipped to the highest standard with, air conditioning, a luxury Jacuzzi, kitchenette with utensils, living room with a television and many more luxuries which will make your stay perfect. In this home made relaxing atmosphere you can stay at our large villa with 3 guest rooms fully air conditioned and equipped for your stay. The villa has a large lobby with a living room area to enjoy by the fireplace. Each room has its own separate entrance with a balcony. Two guest rooms are on the ground floor and a penthouse on the third floor with a private rooftop. In this private and quiet area we have built these quaint suites all equipped with good taste and perfect for your stay. This private area is surrounded by a beautiful courtyard with a garden overlooking the breathtaking view. The site also has its own parking area. The lobby of the estate is pleasant with a fireplace and guests will receive a warm welcome from its hosts who will make you feel at home and leave you with a great feeling. On the hills of the Carmel in the colorful village of Daliyat Al-Karmel, facing the sea we have these 4 guest rooms at the ``Daliya Guest house``. This is authentic Druze country style accommodation which offers visitors the feeling of freedom and tranquility, while enjoying the pastoral atmosphere and welcoming guests to the Druze kitchen, all this making this the perfect holiday. The guest house was set up to endure the natural surroundings and in order to invite visitors to share the experience of the Druze settlement with the locals. The Dor Holiday Village For that magical spring holiday on the beach. On the slopes of Mount Carmel, facing the Mediterranean Sea coast line and beside the natural and magical Dor beach is the Dor Holiday Village with apartment accommodation for couples and families, surrounded by greenery, comfortable seating corners, restaurants and the breathtaking view. Lodging at Ein Ayala.Vacation at the foot of the Carmel mountain, by the sea, with the white beaches of Dor, Nachsholim and Habonim close by. Near the picturesque and interesting town of Zichron Ya-acov. Charming, luxurious 2-room apartment, fully equipped: separate bedroom, kitchenette fully equipped, (milk, coffee, tea) dining and living, European style. Air-condition, cable T.V., DVD, WI-FI, private entrance, parking, garden and terrace. Breakfast on request in the apt. or at the local café ``Café Ein-Hod``. At the Ein Hod Artist Village which is located on the Carmel coast you will find these 2 exquisite and luxurious suites suitable for couples. When you arrive at the private car park and enter the front gates, a magical world of all the beautiful plants of Israel will open up to you, with olive and pine trees, grapevines and medicinal herbs. Opposite the view of the natural and magical forest is this beautiful accommodation unit, the unit includes air conditioning, is fully furnished and is suitable for couples and families. This discreet unit has a separate entrance with a courtyard which has a seating area with plenty of parking. Moshav Eshtaol is only 20 kilometers from Jerusalem and is surrounded by many attractions. A little piece of heaven - great relaxing time.